Sun, sand, sea… and Santa. 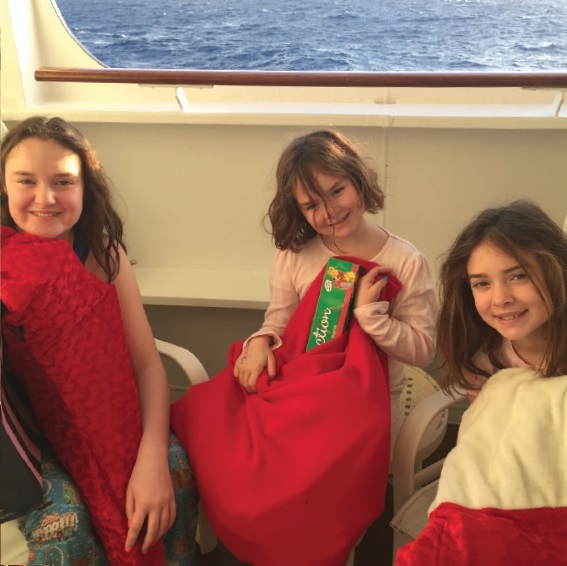 It may not be the traditional recipe, but a Caribbean cruise made the best family Christmas ever, as Louise Robinson reports. It was a simple choice: watching It’s A Wonderful Life while washing up and scraping sprouts into the compost bucket… or having a wonderful life while not lifting a finger and baking in the Caribbean sun. I must have thought about it for, ooh, a whole second. But that’s an adult’s view. This was going to be our family Christmas, so it was only fair that everyone got a vote. My youngest, eight-year-old Lily, came straight to the point. Would Santa know where we are? How would he get into the cabin? What would the reindeer eat? The other two – Daisy and Ellie, aged 12 and 13 – acted a bit cooler. Will it be sunny? Will I be able to charge my phone? New York? Yeah, sounds OK. There must be many ways to enjoy Christmas at sea, but if a blend of traditional British festivities and Caribbean sun is what you’re after, there’s really only one choice. With more than 170 years’ experience, Cunard has pretty much perfected the art of cruising, and for many passengers this grand old line remains the gold standard for Transatlantic crossing. Given a little more time we’d have loved to board Queen Mary 2 in Southampton, but instead we flew to New York, adding a cheeky few days’ shopping before joining the ship for our cruise. The Big Apple at Christmas was a sight to behold. The lights, the decorations, the energy, the crisp winter weather and the shopping (did I mention the shopping?) were the perfect antidote to jet lag. And New York is a wonderful city to explore on foot: the grid layout makes it impossible to get lost, and when you get tired you’ll find the cabbies are a whole lot friendlier than the movies would have you believe, while the subway puts the London Underground to shame. And who wouldn’t love skating in Central Park? The holly on top of our Christmas pudding was a trip to Broadway to see the new Andrew Lloyd Webber musical School of Rock – based on the girls’ favourite film. They loved catching it before it hits the West End (where I’m sure it will be a monster hit when it opens in a few weeks’ time). Mum and Dad liked it too, once they’d got over the shock of paying £80 for interval drinks and sweets. Much as we’d enjoyed our little taste of Manhattan, after four days we were ready for some sunshine. The modern cruise terminal is just over the Brooklyn Bridge, a short cab ride from our hotel in Chinatown (just as well, given the number of glossy carrier bags we’d accumulated). Embarkation was quick and well rehearsed, with many returning passengers greeting the crew like old friends. The Cunard team know that everyone just wants to get on board so the fun can begin – and Lily was particularly thrilled to find a letter from Father Christmas himself, explaining that he knew exactly where she was, and that there was more than enough room in the vast funnel for him and his sackful of presents. “I can stop worrying now,” she said. It was a lovely and typically thoughtful Cunard touch. Privately I’d had my own worries that Christmas far from home wouldn’t really be Christmas at all. But how wrong I was. When you take the festive season and remove all the hard work, what remains is pure, 100 per cent family fun. With the wonderful Cunard crew to look after us, we were free to laugh, tease, eat, drink, tell tall stories, gossip… and play charades (well, you can’t have everything). Our three girls were having the time of their lives. Among the pre-Christmas highlights was a gingerbread house-making competition in the Winter Garden. Imagine that – unlimited gingerbread, icing and sweets. Lily was deeply impressed (“It’s like The Great British Bake Off but you can eat it all!”). The girls did their best, but the results would have got the quizzical eyebrow from Mary Berry. A professional display by the ship’s highly talented chefs showed how it should be done – and despite our efforts at keeping things tidy, it’s perhaps no coincidence that the Winter Garden was completely refurbished this summer (it’s now the Carinthia Lounge, part of a major renovation to make sure the QM2 retains her place as one of the most beautiful ships at sea). On the afternoon of Christmas Eve, while everyone at home was fighting for a place in Tesco’s car park, I was parked in the Canyon Ranch Spa, being mani’d, pedi’d and massaged to within an inch of my life. The girls had disappeared to their various brilliantly run clubs, and my husband had taken root in the library (the largest at sea). Later on, with the big day almost upon us, the ship buzzed with excitement as we Xmas exiles sipped cocktails under the setting sun. Not that Yuletide traditions were neglected: Lily was entranced by the Cruise Director’s reading of ’Twas The Night Before Christmas, and we all loved Carols with the Captain followed by a “snowfall” in the main lobby. That night we took out our treasured Christmas stockings, brought from home, and ceremoniously tied them to the sun loungers on our balcony. I will never forget the children’s faces next morning as they ran in and saw that “he” had been. Even the older two dropped their cool veneer as they shared their little sister’s jumping-on-the-bed joy (some things are the same wherever you happen to be on Christmas morning). But more was to come. Word spread that Santa’s sleigh had been spotted on the ship’s radar and was due to land in 30 minutes. And what was that sound… a jazz band? Sure enough, Father Christmas led a huge conga line, musicians playing and children shouting and laughing, all the way into the Queen’s Room. There was a present for every child on board (Father Christmas is clearly a clever chap) and a glass (or more) of champagne for the grown-ups. It seemed that everyone – literally everyone – was beaming with sheer happiness. How often can you say that? Christmas dinner was a full-on banquet, with course upon course of wonderful festive fare. Our table in the Britannia dining room was as beautifully dressed as many of the guests, who had really pushed the boat out with their Christmas bling. The girls were delighted by the dressing-up element of the Cunard experience, and although their father wasn’t especially pleased to be in black tie, he had to admit it was preferable to a Christmas jumper. Our cruise was evenly split between sea days and port calls. Among the latter, St Lucia, St Maarten and Tortola were our favourites. We opted out of the excursions – though other passengers loved them – and we were happy to spend our shore days rising late and pottering, or taxiing to the nearest beach. All too soon it was New Year’s Eve. We celebrated on British time in the Golden Lion Pub and then, after yet another five-course meal with five-star service, the Caribbean countdown to 2016 began. Three… Two… One… Happy New Year! Balloons cascaded on to the Queen’s Room dancefloor as we sang a mighty Auld Lang Syne. 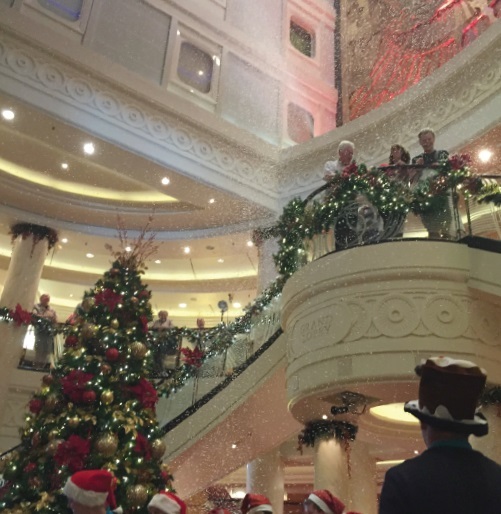 Great weather, great food and fantastic fun are a given on a Cunard Christmas Cruise, but what really surprised me was the entertainment. I used to nod knowingly when Simon Cowell dismissed an act as “cruise ship,” but not any more. On QM2 the shows are as good as anything you’d see in the West End (where many of the entertainers are regulars) and every night we sat as a family, in the front row, transfixed. The drinks were a lot cheaper than Broadway too. The one form of entertainment we didn’t indulge in was television (apart from in the kids’ club). TV was available in our cabins but we didn’t switch it on. Did we miss it? Not for a moment. Instead we enjoyed an old-fashioned family Christmas at its very best, with the added bonus of sunshine. And looking around me I saw many other families doing the same, often with three or four generations in the same party.